A gift card from Bloomin' Brands, Inc., is perfect for any special occasion. Whether it’s a birthday, anniversary, incentive or a thank you, treat your family, friends and business associates to an incredible dining experience. 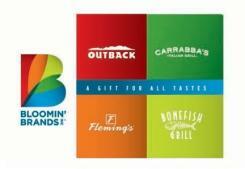 The Bloomin' Brands Gift Card is valid for use at all U.S. Outback Steakhouse, Bonefish Grill, Carrabba's Italian Grill and Fleming's Prime Steakhouse & Wine Bar locations.